This week, amongst others Burger King helped Mc Donalds last month and Japanese restaurant allows guests to work for their meal. JustTea’s Purple Leaf Tea is a new category of tea, completely unique to the world market. When a few drops of lemon are added to the tea, the liquid changes to an enhanced purple-pink colour. Besides that, the tea also offers some great health benefits and supports small-scale farmers. This week, amongst others about the art of matching beers with desserts and a Pizza Run will be organized in London. Two weeks ago, a new unique concept opened in The Hague. Sweet Mirrie’s makes ice cream as we already have spotted a lot in the Far East. The teppanyaki ice cream is not brand new, we spotted it before and wrote about it before. But we haven’t spotted a concept like this before in the Netherlands. A Gentleman’s Afternoon Tea at the Swan Shakespeare’s Globe in London, part of ‘A Midsummer Night’s Dream Afternoon Tea’. Instead of the regular choices of tea and a glass of champagne they serve the tea as well but also a tankard of Hobday Smoked Brown Ale and more savoury choices of small bites. Inspiration for all those restaurants serving afternoon teas! Is your schedule still empty for tomorrow night? Call your friends and go watch a movie in a cinema! Not just a normal cinema, but at the IKEA open air rooftop cinema on the rooftop of IKEA Delft in The Netherlands. During a meeting of MVO Nederland (organisation Corporate Social Responsibility in the Netherlands) and Wageningen Academy, meat company Bolscher introduced a new product category, between meat and vega. The meeting ‘from food waste to food business’ was organised to prevent waste and make use of residual flows. The residual flow of ‘mushroom stems’ is used in one of Meat Your Veggies’s products. Visitors of the Zwarte Cross festival in the Netherlands can make a pit stop at ‘t Noorden in Aalten. The festival will start this weekend and party centre and pancake house ‘t Noorden is located on the route towards the festival. To attract more visitors in the days before the festivals, they decided to put some extra items on their menu. One of them is Nozem Ice Cream, made in collaboration with a farm where ice cream is being made. The ice cream is based on a popular drink being sold at Zwarte Cross: Nozem Oil. We already spotted them back in May, the limited edition Gin & Tonic popsicles that were sold at Aldi in England. The coming weekend (from the 7th till the 9th of July) they are also exclusively for sale at Aldi in the Netherlands: Gin & Tonic popsicles and Prosecco & Peach Bellini popsicles! A part of the former and notorious prison ‘Bijlmerbajes’ becomes a pop-up hotel run by asylum seekers. At The Movement hotel, refugees will be trained to run a hotel and get back into the workforce, their chance to reintegrate. On the 4th of July, a crowd funding campaign is launched to enable this special project. The hotel is intended to open its prison doors early August and give their guests a once in a lifetime experience to explore and stay at the famous Bijlmerbajes before it gets demolished. KLM Royal Dutch Airlines offers passengers who visit Amsterdam in September a handy gadget: the KLM Care Tag. The smart audio luggage tag automatically provides visitors with location based verbal tips on how to traverse the city. The specially designed location-aware audio luggage tag consists of an offline GPS module and a speaker. While you’re walking or cycling through the city, it offers the right tip at the right location at the right time. All over Amsterdam, KLM plotted the voice of their caring crew at spots where people can use some extra assistance. A visitor can simply attach the tag to her/his luggage or clothes. Interesting news for your hotel or AirBnB guests. All men working in Rotterdam will have the possibility to celebrate the start of the summer holiday season and drink a draft for free. You only need to deliver your necktie Friday 7 July at Van Zanten café, ‘een tappie voor een dassie’ (Dutch slang meaning ‘a draft for a necktie’). For those who have to work before the summer holiday starts, come and exchange a tie for a glass of ice cold beer to celebrate the fact that we have fewer traffic jams the coming weeks! To celebrate the opening of a new W Hotel in Bellevue, Washington, the hotel has made a game at which gamers and guests can win great prizes. ‘Belle the Bear’, as the game is called, lets players explore the city and promotes the new hotel at the same time. Bavaria introduces Bavaria Radler Ice Lemon 2.0%. Bavaria Radler Lemon 2.0%, now for sale on a stick. The Dutch beer brewer is the first major brewer with an ice cream made of Radler. The refreshing ice cream has a light sweet Radler flavour, with tones of lemon and 2.0% alcohol and will be available from this summer at several festivals and events in The Netherlands. Festival Wish Outdoor in the Dutch village Beek en Donk was the first event to present the ice cream last weekend. Game of Thrones Bar | Located in Washington D.C.
Are you addicted to the Game Of Thrones series? Than you should book your ticket to the United States. Last week, a Game Of Thrones Bar opened in Washington D.C. Game of Thrones fans can raise their glass with other fans at the new 3,000-square-foot “Pop-Up Bar” (PUB), all inspired by the HBO series based on the novels of George R.R. Martin’s. At Horecatrends we spot a lot of national and international trends on a daily basis. We pick the most interesting ones to write articles about, the smaller trends we use in our column ‘Trends we spotted this week’. This week amongst others an IKEA cooking book and a Twix spread got introduced in the Netherlands. If you like to read the whole article, click the title. Enjoy reading! Two recording studios equipped with top-notch professional equipment located 36 metres above the River Spree epitomise the first-class service provided by nhow Berlin. The conference rooms and nhow suite are all networked to the studios, opening up a whole variety of opportunities from team-building events to recording vocals and interviews. For music fans, the hotel offers a comprehensive variety of services ranging from the guitar room service to live gigs. 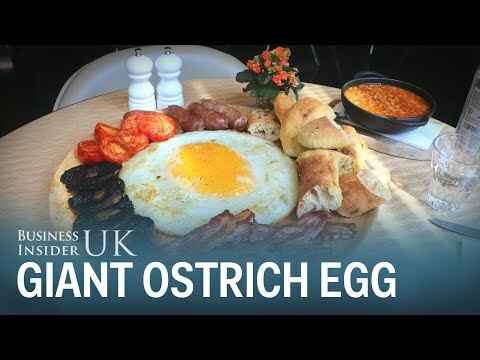 Florentine Restaurant & Bar in London served their supersize take on breakfast with an ostrich egg. Too big to handle on your own, but perfect to share. An ostrich egg full English breakfast with tomatoes, mushrooms, bacon, beans, sausages and bread…. If you are a Breaking Bad fan you should definitely go ABQ, a Breaking Bad inspired bar in London. The bar, which has popped up in the UK for the last two years, is set in an RV, just like White’s meth lab in the television show. And they will also pop-up in NYC this summer. We just launched a Dutch Whitepaper about the Wellness industry in the Netherlands and one of the international trends we spotted is the healthy cuisine. Wellness is about feeling healthy ‘from body to mind’. One of the features of a healthy lifestyle is a cuisine with more focus on ‘foods with a function’. Like turmeric, a power food that’s often used in the Ayurvedic cuisine. In the wellbeing approach they often use Ayurvedic treatments. We spotted restaurant Divya’s Kitchen in NYC, serving meals that would be an asset for a menu at a restaurant in a Wellness resort. ‘Tipsy Robot’, a bar only operated by robots will open on the 30th of June at The Miracle Mile Shops in Las Vegas. The robots at ‘Tipsy Robot’ exactly know how to make personalized cocktails. Fastaway is a new app where you can order and pick up food and drinks at train stations. The app targets busy train travelers, and is developed to avoid long queues. Furthermore the app allows people to pick up their orders at participating stores directly. By this way they will never miss a train connection anymore. The app is not live yet and is planning to launch in September. Plenty of bars have an endless list with Gin & Tonic combinations with different ingredients such as cucumber, grapefruit or rosemary. But this summer it’s time for something new! Fever-Tree introduces a special pink tonic, the Aromatic Tonic Water. A new sparkling beverage to make Gin & Tonics even better. To promote the launch of the new Despicable movie that will take place on the 30th of June, McDonald’s introduced a Minions inspired menu in Singapore. So if you like junk food and love the Despicable movies, you know where you have to go. Unfortunately the minion menu is only available at select McDonald’s establishments. We are quite certain that lots of other Minion fans would love to have a Minions inspired Happy Meal. We cannot deny that ice cream burritos and ice cream tacos have become popular! Now we’ve spotted Sugar Sugar, a dessert shop in Ontario, Canada. Sugar Sugar serves a cotton candy burrito, a ‘burrito’ filled with ice cream. A great creation for people craving for sweet stuff. At Horecatrends we spot a lot of national and international trends on a daily basis. We pick the most interesting ones to write articles about, the smaller trends we use in our column ‘Trends we spotted this week’. This week amongst others a FG Food Labs bike tour and after the success of the Top 50 Best Restaurants there will be a Top 50 Pizza in July. Yesterday was the longest day of the year and maybe also one of the hottest in the Netherlands. SPARK, the cocktail bar of Hilton The Hague surprised car drivers and cyclists with free homemade lemonade during the evening’s traffic jam. EVEN® Hotels, the new hotel brand of Intercontinental Hotels Group (IHG) are focusing on guests who would like to stay active, healthy and well-rested during their holiday or business trip. This philosophy is visible throughout the entire hotel. There is healty food, you can exercise wherever and whenever you want and your entire hotel room is designed to give you the rest you need. Not hospitality but sportspitality.